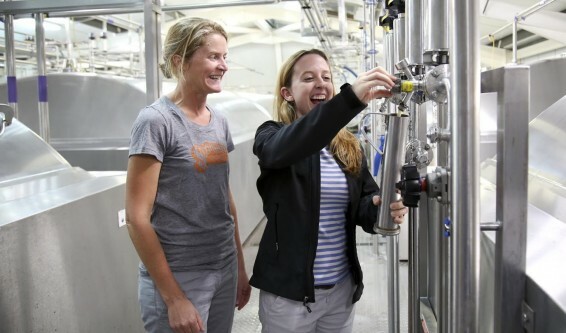 Heather McReynolds, Brewing Manager, is shaking a cask, and reaching in to pull out a rotting bag of once-fresh hops. The cask came from another brewery, then got here from our distributor. The hops are old, they’ve been in there for a while, and they smell. She’s joking around, but there’s some truth to that. Cask ale is probably not your first thought when it comes to American beer, and certainly not when you think of Sixpoint. It’s time intensive — the casks are harder for us to clean than pressurized kegs — and our real ale isn’t that widely distributed in the USA. We clean the casks by hand, sanitize them by hand, and fill them by hand. This sort of moderate ABV, more traditional cask ale we like to make doesn’t have the largest audience in the US at the moment… it’s more of a specialty product for dedicated real ale drinkers. It’s a style of beer that has nuance you can’t get from other brews. And you certainly don’t hear the **hype** about serving an English Mild with a small fistful of Columbus, that you might about a cask beer “dry-hopped” with chunks of mango or cacao beans. We’re not saying traditional cask ale is better, but it certainly has its place, and it’s worth the effort. We brew small-batch real ale continuously for NYC and beyond, like our Growler Dark Mild, and offer other brews like Righteous and Otis on cask on occasion. We’ve also begun brewing every so often with our friends at Adnams Brewery in Southwold, England, where cask ale is more common. We’ve crafted cask versions of Bengali and Righteous across the pond, along with new formulations Make it Rain and BKLYN Bitter. It’s our homage to British traditions that we respect and enjoy. 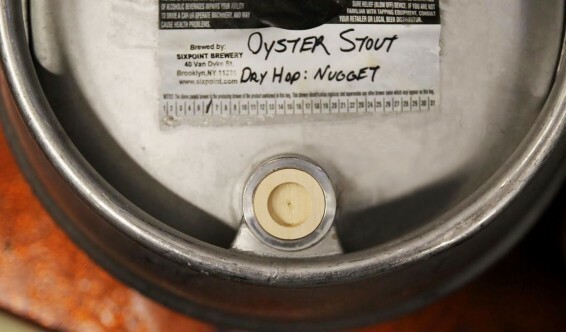 Secondary fermentation in the serving vessel, a large part of what defines cask ale, is more a part of Sixpoint history than you might think. We’re founded on the idea that Beer is Culture — it’s a living thing, constantly evolving and changing. Where better to experience that beer culture than in pubs, cultural bastions in their own right, drinking living beer?